By now everyone knows I’m a huge Dries Van Noten fan. I love the way he mixes color, pattern, textures, and cultures. I’m really starting to feel the same way about J.Crew. 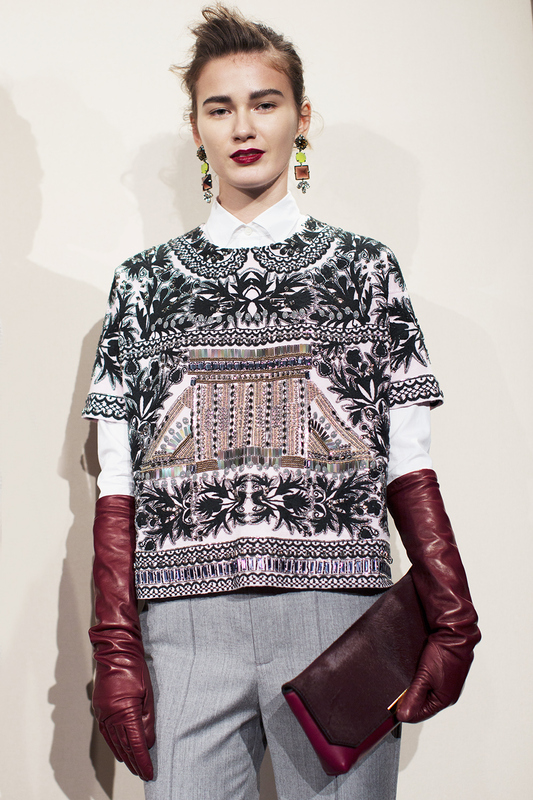 Just look at their recent Fall 2013 presentation; it’s like a classroom of fashion. This is an education on how to work all the best elements of design into a very pretty package. Don’t believe me? Try this: print these pictures, hang them on your wall upside down and I bet you’ll still be totally inspired from just the color and pattern mixing. I just adore this crazy mix and match of patterns and textures! It looks absolutely perfect and very Dries. 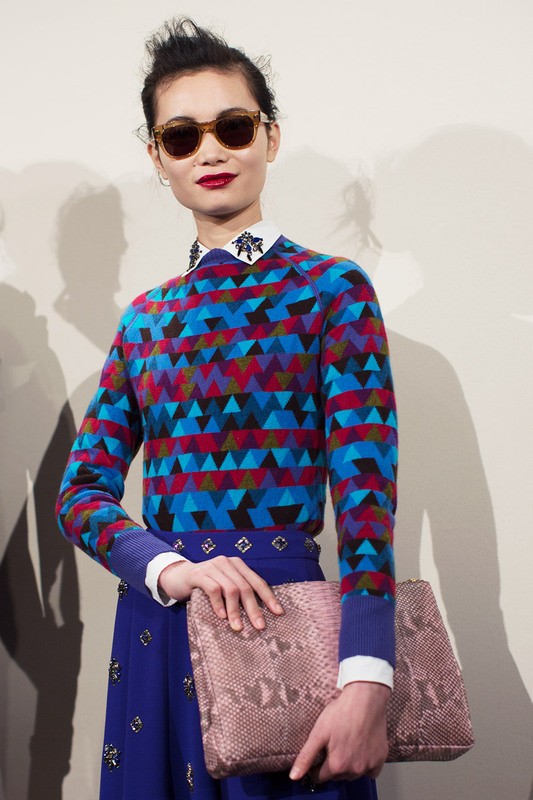 Couldn’t agree more – the styling is impeccable, and the mixture of prints/textures/colours are a feast for the eye! Just love it, bravo J Crew! ok..I really can’t choose a favorite! Jcrew just gets better and better! Amazing! I really LOVE this collection, these fabric combinations is fantastic!!! This collection is a set of the most beautiful looks I have ever seen. I would buy it all if I could only afford it. I really love the colors and print, and the gloves are gorgeous! Love this collection!! !great job Jenna!!! I’ve always been a J.Crew fan, especially of J.Lyons. I’m not surprised to see such a strong display of colors and patterns. It’s “elegance decontractee” (casual chic). I love the no-fuss hair style. It is buttons up this season! I agree with you, mr. Schuman. Just look at the second photo from the bottom. The pattern on those pants is just gorgeous! I love J.Crew!!! 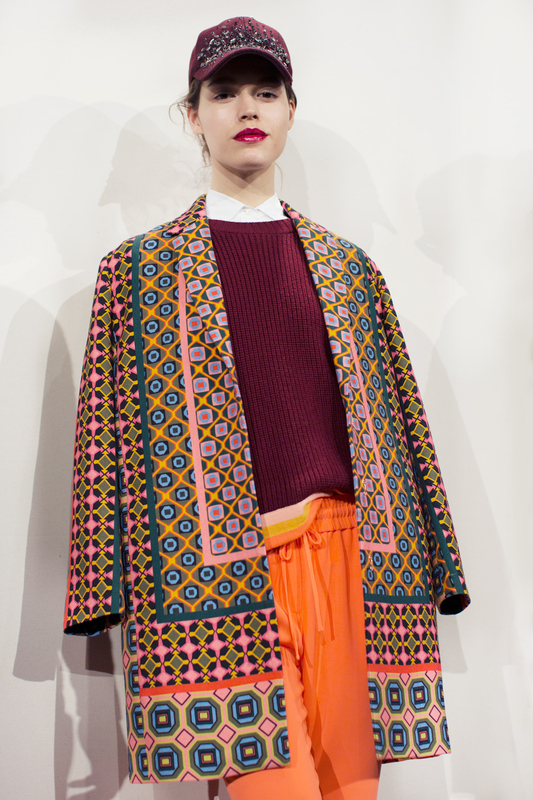 The prints and colors are always so inspiring. The new Spring collection just out in stores is just so amazing! They’ve really hit the jackpot with these patterns, textures and mixes of wool, silk, leather. Now they need to go after the men’s fashions and inject, ever so subtly, some new patterns, to bring life and color into the somber boredom of male dressing. This is pure perfection! Love absolutely every single piece! I’m loving the cobalt + black combination! 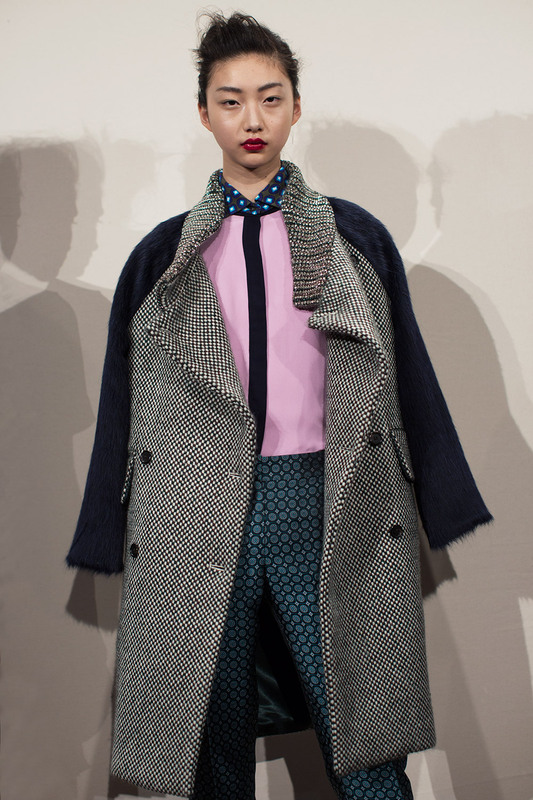 Adore the mix however it is sad the tailoring and quality does not reach consumers via RTW. That looks great. I like all that outfits and that last one. Have a nice day. incredibly top gorgeous. I cannot even start to pinpoint my favorites. And I so agree with you about Dries being one of my all time favorite designers and why this also starts to expand to J. Crew. Love the faces and the clothes and the atmosphere between it! 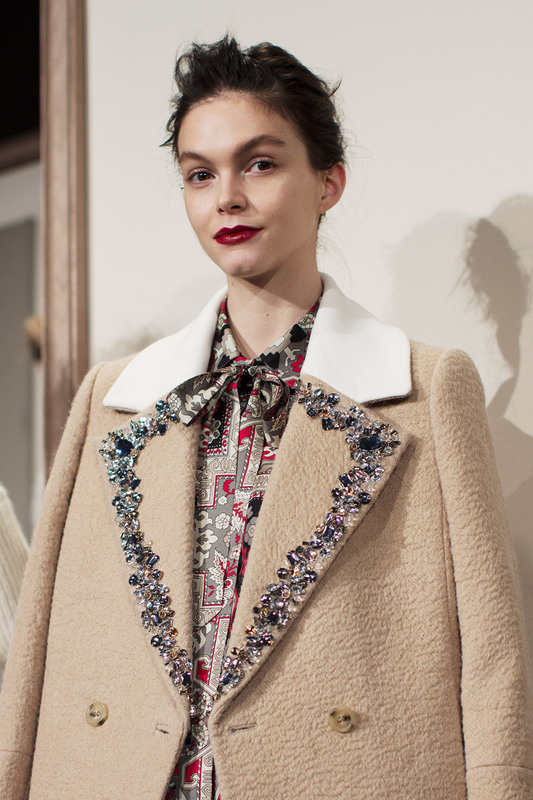 Many things are very Miu Miu ! 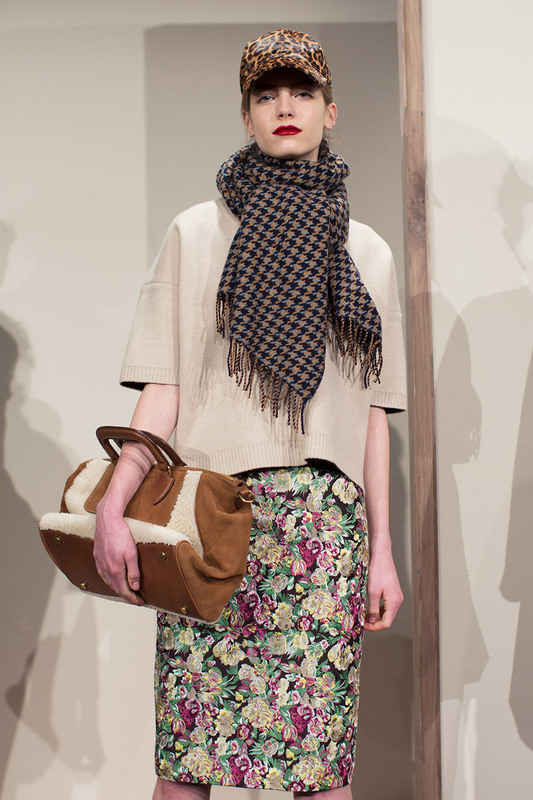 J.crew gets better every season. Winter 13, WOW! Love it! Why hello j crew. this is a boss collection for this brand , makes me like JCrew a lot more once again. The second and third coats are really, really incredible. I’m in love with the prints !!! and I’m found of the model also she’s great ! Impressed with how J.Crew has broadened their aesthetic (all the stuff Scott mentioned) while managing to hew to their traditional vision (the tweeds, the khaki, the sweaters). I’ll take one of each, please and thank you.))) Interesting thought you have here. I love J.Crew so much. You’re totally right, each and every collection is like a classroom of fashion. Tom Mora did a SUPERB job with this collection. I like his style a lot more than Jenna’s. Love. Love. Love! Dries Van Noten is on the top of my list and I definitely see the influence here. I like the patterns and textures. But it takes some getting used. 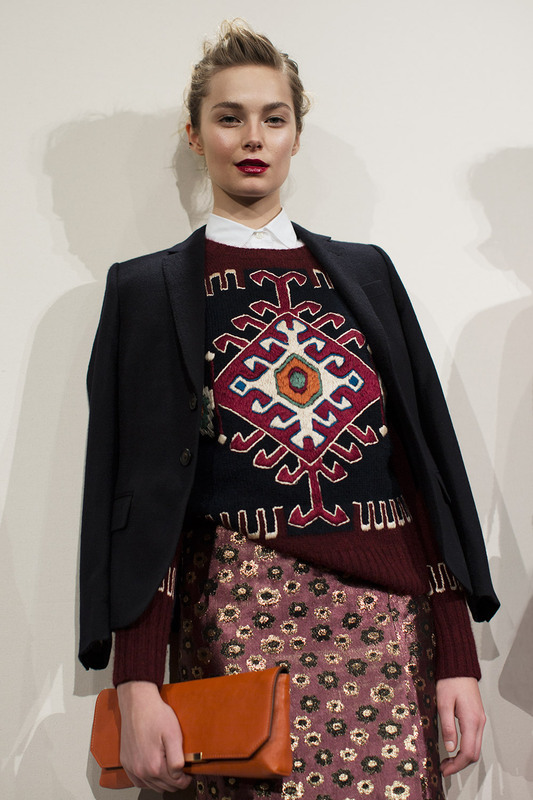 That first sweater looks like it might have a cultural appropriation problem, which I am sooooo done with, but other than that the mixing is great. Love that hair, too. Every collection Ms Lyons presents is more sophisticated, nuanced and original than the previous -but they are all perfection. The combinations of patterns, colors, proportions, and accessories – it boggles my mind how gorgeous it all is, and how marvelously it all works ! Love J. Crew. I think this collection is gorgeous, wearable and affordable! Astonishing! Yes! Would blow these up and put them on my walls as art – would never grow tired of it! Those gloves! 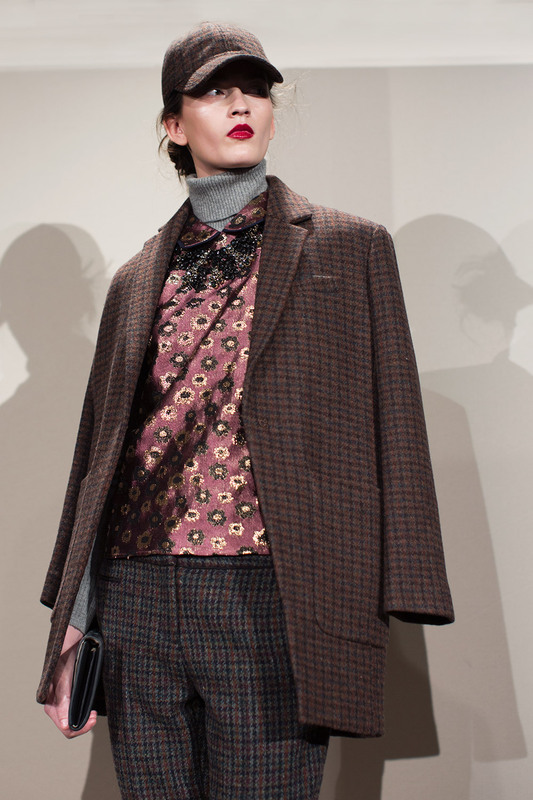 That oh-so-subtle mix of tweed and herrringbone in that coat! Didn’t know J Crew actually had a “show” like this. Is there a men’s version? J Crew has some of the best styling I have seen. This looks so amazing, so luxe. Really lovely. This is such a great collection. Love love love the gloves and scarves! I agree, the patterns, detailing, colors, and shapes are phenomenal. The clothing they design not only shows craftsmanship, beauty, and practicality but also a fearless sense of how to dress trendy with the right amount of intensity. 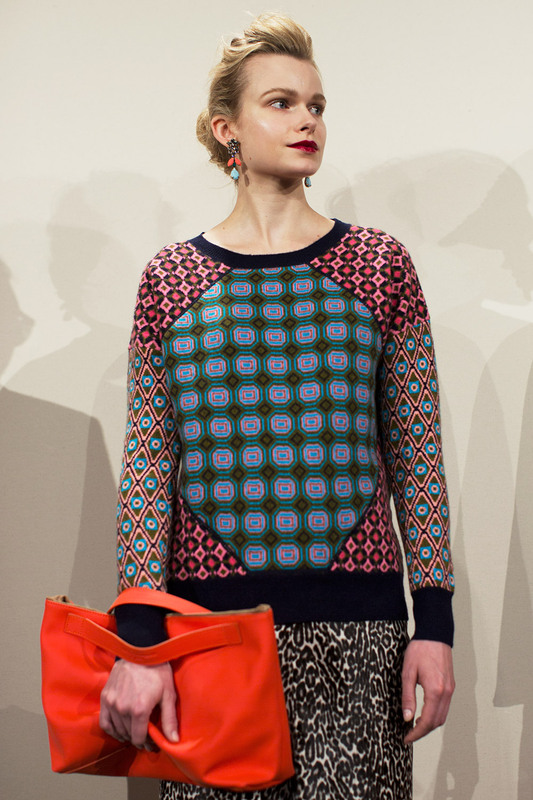 Move over Miucca,JCrew is onto you..Great balance of eccentric chic. Absolutely love the JCrew Fall collection. Amazing prints and lovely colours! “Torontáli szőnyeg”. Art and fashion is global! I’m definitely coming back for inspiration! I just want all coats… Superb!! There are so many things to like! I really enjoy the idea of swanky rhinestone jewelry w/ sweaters and that plummy lipstick they are all wearing. If only the quality of JCrew clothing was at the same caliber as their aesthetic. Much of it is cheaply made in China and borders on fast-fashion. So true! I’d be more proud of having a closet full of JCrew if the quality were better. Can’t have style without substance. It’s not that it’s uniformly cheaply made–I have a lot of pieces, even recent ones, that I love and know will last forever. But quality is inconsistent (even with the Collection) pieces! I love my local brick and mortar shop, but after I move to NYC in a few months I’ll only rarely shop there. :( Too picked-over, too stressful to go to the JC stores in person in Manhattan–but then online you can’t rely on the quality (or, increasingly, the fit)! That said–bravo Scott, for not being a snob about talent. Jenna Lyon’s eye is worth a million bucks, whether it’s helming fast fashion or couture. Brava! From Persian rugs to Emilio Pucci, these gorgeous ensembles are suffused with cool influences! Well, I’ve been mixing a herringbone hat with my leopard print coat all winter, and I see I am RIGHT ON TRACK! LOL. Anyone wearing an Ikat pattern (first photo) better be careful not to blend into the furnishings! Ikat patterns are everywhere now — on decorative pillows, as upholstery on couches and chairs, and, of course, in rugs. the collection is extremely beautiful!! I’m thrilled with the daring direction J.Crew has taken. It’s come a long way from little embroidered animals on khakis. 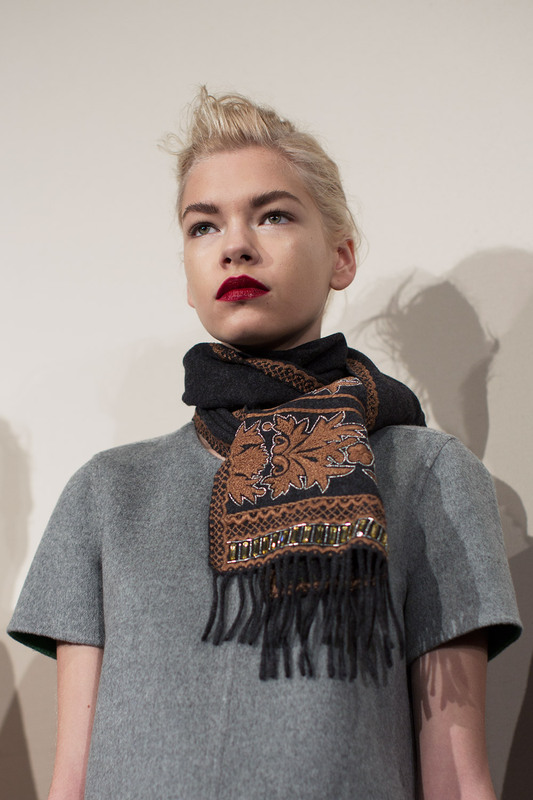 If I was Dries Van Noten, I would want a royalty. A feast for the eyes! I love EVERYTHING about this!!! But what is so original to be “the second Dries”? Just boring. Its the affordable Dries.Maybe more boring, but less cash. Sadly JCrew always has the same exact fit for all their clothing, they haven’t changed it since the 90′s at least. Always the cropped low rise, slouch pants, always the on the hip knee length pencil skirt. They need to invest a bit of time in changing up the fit, not just doing the same exact thing. Its good for layering, and has that “look” but it really can’t do anything else. Dries has a completely different fit, and also the quality and sharpness of the prints is different…not to mention that JCrew Does NOT bother to line up the print at the seam at all! Half the time their stuff looks good from the front, but the back seam is wonky with pattern lines going every which direction. I guess you get what you pay for. Have to say the pictures are gorgeous. I’m not a J. Crew fan, but the Shasavan inspired design makes my little heart flutter! 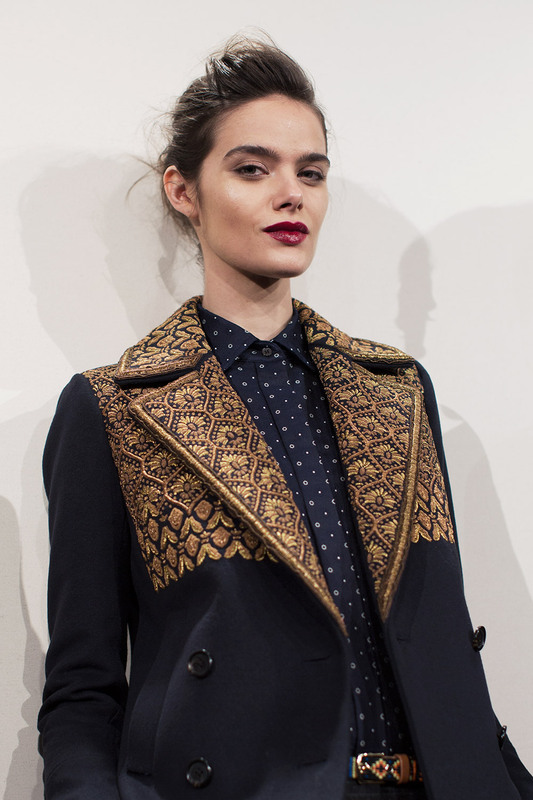 It seems that the first few looks are inspired by the textiles in my native Afghanistan, they’ve got the carpet motif on the sweater, lapis blue dress, gold embroidery on the black jacket that we use on women’s dresses, and the beige coat reminds me of my grandfathers wool “chapan” that he used for hunting. Two weeks ago my friend and I did a photoshoot using that chapan and she wanted to add the jewels to the neckline just as it was done here. I am so happy to see this collection, there are so many beautiful patterns and colors used in Afghanistan’s textiles and I have only seen Dries and Marchesa use these in their collections. Love the colors and patterns….can’t stand the slouchy at the hip fit of the pants, and the long tops. So I guess its a not. Fit is more important to me then the color. Dig the gloves, though. If it was higher waisted, and a little more to the waist I’d definitely wear it.